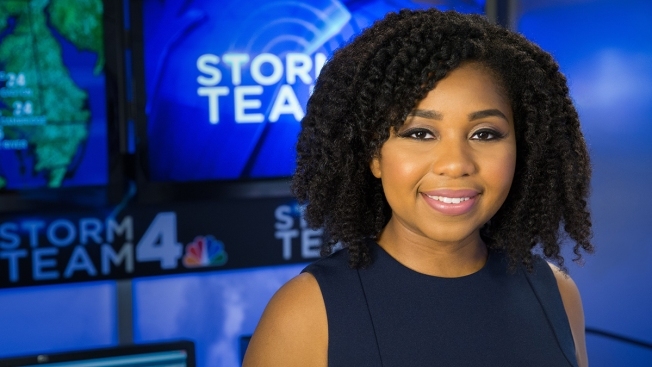 Somara Theodore is a Meteorologist with StormTeam 4. Her forecasts can be seen during the weekend editions of News4, on NBCWashington.com and on 103.5 WTOP Radio. She joined News4 in 2016. Theodore's passion for weather grew out of her experience growing up in cities with different kinds of seasons such as Los Angeles, Atlanta, Honolulu, New York City, and Pottstown, PA. Throughout college she conducted research with a NASA-funded research team through Penn State, analyzed data at NOAA's Center for Atmospheric Science at Howard University and participated in a field study in China. She has also interned with WUSA CBS 9 in Washington D.C., WGCL CBS Atlanta, and The Weather Channel. Theodore graduated from Penn State University with a major in Meteorology and minors in Energy Business and Finance as well as Mandarin Chinese. While attending Penn State, she was a student meteorologist with the Campus Weather Service. From there Theodore began her career as a weekend meteorologist in Savannah, GA then headed over to Cleveland, OH where she worked as the morning meteorologist on Good Morning Cleveland! It was there she won an EMMY for her morning weathercast of a deadly plane crash in Akron. Theodore's family is native to the M in DMV, so she is excited to be close to them. She loves to help the community and reach people in any way she can. When she is not on air she enjoys ice skating, eating roti and she is an avid Instagrammer so be sure to follow her @SomaraTheodore!